Why Would They Miss You? Would they miss you if you were gone? What would have to change for that question to lead to a better answer? This prompt for Quest 2016 is very similar to the prompt Seth Godin contributed to Quest 2015. Last year’s prompt was “Who would miss you if you were gone? If you didn’t show up to work, didn’t send out that newsletter, didn’t make that sales call, didn’t tweet that tweet… who would miss it? How does your answer shape how you’ll live out 2015?” My answer was the only people who would miss me would be the people who had seen the authentic me. Everybody else would miss their image of me. And the inspiration was to head into 2015 bringing more of my authentic self into my work. I have done that. I continue to do more of it. My clients would miss me if I were gone. But, Godin’s second question is more interesting to me. 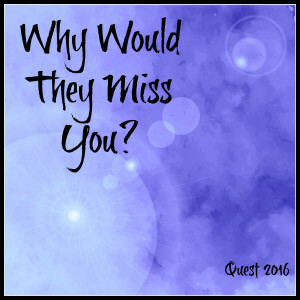 For “that question” to lead to a better answer, it would need to be a better question: Why would they miss you if you were gone? I am sure this prompt is related to Godin’s book Linchpin in which he argues that people should aim to become indispensable in their work. I am indispensable in my organization. I am my organization. I am a solopreneur. But, I do not want to be indispensable to my coaching clients. I do not want to be missed because things fall apart without me. In fact, if my clients fall apart when I am no longer working with them, then I will have done them a grave disservice. My job is to empower my clients not disempower them. I want to be missed because I am a valuable resource, a trusted witness, and a useful companion on my client’s journey through the constantly changing terrain of life. The why of my being missed matters. In my work, I show up with my full self to witness my clients and put all of my skills and resources in the service of their fulfillment of their dreams. When I do that, I am not only helping them take powerful actions toward fulfilling lives in alignment with their values and standards, but I am also modelling for them how to support themselves when they are not with me. In the long run, my clients learn to self-manage, and also come back to me for support when they recognize that they need it. I can honestly say my clients would miss me for the right reasons. Seth Godin is the author of 18 books that have been bestsellers around the world and have been translated into more than 35 languages. He writes about the post-industrial revolution, the way ideas spread, marketing, quitting, leadership and most of all, changing everything. When I went from the mother of one to the mother of four within 5 minutes, I changed. With one child, I had been a fun, creative, engaged mother with a deep commitment to doing what was best for my high-needs child. I willingly gave up my own sleep for my son’s and gave up my immediate goals for returning to work and theatre once it became clear that my son wasn’t thriving with other care-givers. When the triplets were born, I had no choice but to spend all my time focused on child-care. Caring for infant triplets takes all the time you have as a parent and my eldest was a high-needs preschooler who demanded my time. My husband came home from work every day to work as hard as he did at work. We were lucky. Gifts from family paid for months for a nanny to help me, and we spent our savings on a second. I was a stay-at-home mom with 16 hours of professional help with the childcare 5 days a week and I was still struggling to provide the basic care my 4 kids needed. I was always exhausted, and always busy. It took 6 months before I could take any time for myself without my mother travelling 300 miles to stay. For the first 4 years, I never got less busy. As the children developed and needed less intense care, we hired less help, but I never got less busy. Then, school became an untenable environment for one of my kids and I pulled him out to homeschool. During these years, my adrenals were in overdrive and I was living in stress-induced “must be responsible or the entire world will collapse” mode. I started to act and direct again. I started writing again. But, I didn’t start to really play again. There was a certain joyful play that I didn’t let back into my life. 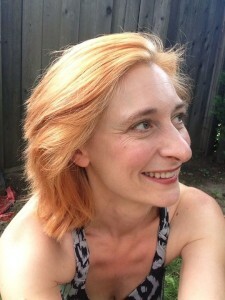 Early this summer, it became clear I needed to embrace my youthful playfulness at a new level to start enjoying parenting at a deeper level and to provide the best coaching to my creative clients. After a session with a coach of my own who helped me tap into memories of a freer and more playful time in my life, I created a multimedia “self-portrait” of the most exuberant, youthful, play-loving part of me. I wanted to deepen my connection to those memories, so I let that self-portrait influence the way I presented myself to the world. I let that part of me go clothes shopping and bought dresses in bright colours and patterns that I had not worn since becoming the supermother of intense triplets plus one. I dyed my hair blonde. 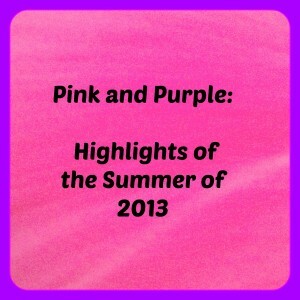 Then, I started adding pink and purple highlights. I have been using Manic Panic gel. 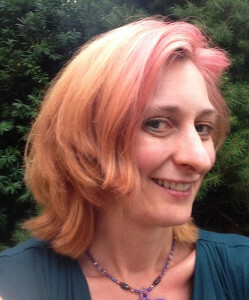 It washes out and I get to try new variations any time I like – which this summer has been almost every day. Because it washes out, I don’t mind the kids using it. So, not only do I get I get to have fun, I get to be the fun mom, too. More importantly, by expressing my creativity in my hair, every time I see my reflection, I smile and remember the power of play. 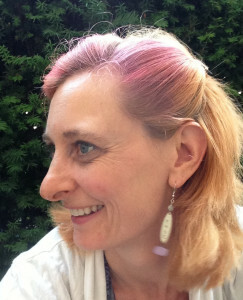 Have you dyed your hair pink lately? Maybe you should try it? It’s lots of fun! Stand Out. Don’t Fit In.